The Flash's Danielle Panabaker tonight tweeted an image that seems to be the first semi-official look at the Reverse Flash. 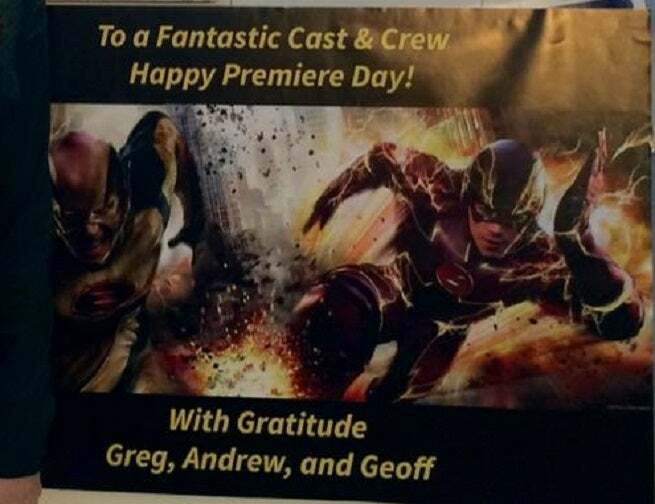 You can see a banner above, thanking the cast from executive producers Geoff Johns, Andrew Kreisberg and Greg Berlanti...and featuring The Flash along with a yellow-and-black-clad character who seems to be the Reverse Flash/Professor Zoom. The black, along with the very demonic/evil face, is reminiscent of the New 52 iteration of the character, whose secret identity is Daniel West, Iris's brother. Of course, we know that he won't be, since this character is white and both Iris and her father are black in the show. Certainly one of the fun exercised you might have is looking at how much like Grant Gustin that Flash looks...and then comparing the Zoom face to Rick Cosnett, Tom Cavanagh and other prospective Reverse Flash candidates. Big rehearsal......HUGE EPISODE!!! #ARROW SEASON 3!! ...Now, that's a lot of swords. Not for nothing, but I have to assume that one of those guys is Ra's al Ghul's stunt double, right? In any event, it seems that both Arrow and The Flash are going to follow up their crossover episodes with midseason finales that are pretty huge in scope, and probably feature some of DC Comics' most memorable villians.